Nothing ruins Christmas quite like exams in January. Of the main revision periods, our Twitter poll shows that the vast majority of law students most dislike revision over December. People are more likely to feel unprepared for exams in January quite precisely because they truly are unprepared. Realistically it's only been a few months since the academic year started, so few will have gained great confidence with the subjects they are dealing with. 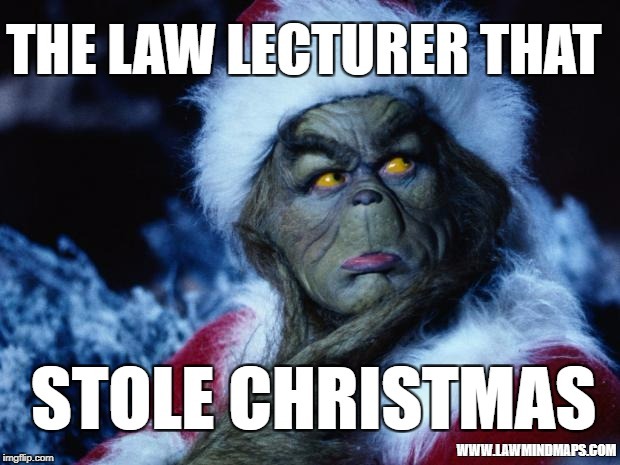 Often friends and family who have never studied law add to law students' feelings of stress and guilt because they can't understand why you can't make the same time for festivities they often expect you to. The important thing is to try to be as efficient as possible, manage your time, allot some time for fun but try to stay balanced. If you're a City University law student, the Pro Bono society has arranged for LawMindMaps to present its "Learn The Law Efficiently, Easily & Enjoyably" session on 6th December. City Uni Law Students can sign up to attend and by signing up in advance, they can get a free mind map of their choice. More info on Facebook. If you're not a City University and would like LawMindMaps to run a session at your university, contact your student law society or pro bono society and ask them to arrange it. Mind maps have been shown to be an efficient way of learning, but as it takes a very long time to make good, informative, clean mind maps we have pre-prepared BPTC, LLB/GDL and LPC mind maps which you can use for exams in January. Make sure you have fun over Christmas - perhaps study with law school friends before celebrating - but ensure you commit adequate time to studying during the vacation. Below we've offered some specific advice to try to maintain the joy of the season whilst you study. Honestly, not much really happens at Christmas How many times have you seen that Indiana Jones movie anyway? Sitting down to a load of law revision over Christmas seems unfair when most other people are doing nothing. However, since nothing much is happening, it really is a great time to get some dedicated work done. Have lunch with your family, play some boardgames, watch a film you've seen a million times before - but when there's honestly nothing really else good to do, go ahead and do some revision. You've got all this time with family and friends at Christmas, so perhaps play a quiz with them to help you remember cases. It's cold out, they might be bored too, so it will be a good time for them to help you. And if they haven't been to law school, they might even like to learn something. 4) Your quiz master(s) must read you the ratio / case summary, and you need to state the name of the case. 5) If you want to be really challenged, do it the other way around: get them to state the case name and you state the ratio / case summary. How many can you get right within 10 minutes? After that, review which ones you got right and which you got wrong, then play again in an hour. Getting a study group together is advisable at any time of year. Revision is so much easier with others. A good study group has everyone contributing equally: pooling resources, spreading the work load, testing each other, sharing the cost of study aids like LawMindMaps and - most importantly - helping to build in some fun. One way of building in fun is to play case name charades. Everyone within the study group spends time reviewing a set of case summaries, perhaps the ones within a LawMindMap. Then each person chooses a case to mime to the others within 2 minutes, just as they would with charades. The person who can encourage others to guess the case within the shortest amount of time wins. Build a timetable or study plan for the whole "vacation" and within it make sure you set aside time to see friends and have fun. Go ice skating, head to Christmas markets, play on the Ninendo Switch someone just got. But then, I'm afraid, go learn some more law. People can enjoy alcohol, it can be a relaxant but it's also a depressant. Hangovers ruin a revision day. Also, even moderate amounts of alcohol can arouse negative emotions, add to stress, make you feel sick and disrupt your sleep. If you find yourself at numerous occasions with alcohol over Christmas, build in some days where you will not drink. It's a time for giving and receiving, and perhaps to dump the not-so-healthy competition amongst law students. Law school, whatever level, is time-consuming and can be difficult. So if you know a law student that seems to be having a tough time of it, give them some support -and let others support you too. If you've found LawMindMaps helpful - which we know many have as they have come back for more mind maps for additional subjects and courses - don't keep it a secret. Help your fellow students by telling them about LawMindMaps.com, place a review on Amazon and/or on this webite, or simply share our Facebook, Twitter or Instagram pages with them. Undoubtedly you've been told of the importance of staying up to date on current affairs and what's going on in the legal industry. That's why we aggregate most of the important legal news and articles being shared on Twitter each day into a LawMindMaps online paper. Use the "More" button at the top right of the paper to get more focused on your particular interests. You can see our daily news by following @lawmindmaps. Like so many other operations, Christmas interferes with our office hours and delivery times. If you are thinking of getting any mind maps to support you over the Christmas vacation, we urge you not to delay. Have a great Christmas and all the best for any upcoming exams.